Stan: Wow, your dad's a perv and your mom tried to kill you. Butters: Yeah, you guys sure are gonna rip on me at school. Butters: Yeah, but as soon as we get to Bennigan's and I get my mozzarella burger I'll forget all about my dad being queer and my mom trying to kill me. 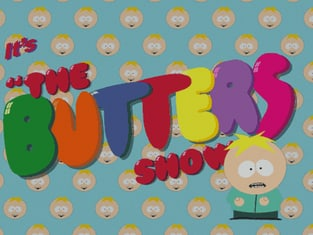 South Park Season 5 Episode 14: "Butters' Very Own Episode"
Reporter 1: Mrs. Stotch, what did the kidnapper look like? Repoter 2: Was he tall, short? Linda: He was... average Puerto Rican height. Chris: Oh, god! Oh, ohhh! Butters: I'm glad I found you! I think I know the perfect anniversary present for Mom. What are you doing with your wiener out there, Dad? Chris: Butters, you need to leave here right now! You need to get out of here! Go home and wait for me to talk to you. Butters: Oh...well, alright then. Well, see you at home! Chris: Oh, Jesus no... oh, what have I done?